1 of 4 For marinade, toast cinnamon, pepper, coriander, cumin, cloves and cardamom in skillet over medium-high heat until very fragrant, 2 to 3 minutes; cool. Transfer to small bowl. Stir in paprika, garlic, sugar, salt, pepper flakes, oil, juice. 2 of 4 Cut wing tips off chicken; halve wings at joint. Combine wings with marinade in plastic bag. Refrigerate 45 minutes. 3 of 4 Heat oven to 450 degrees F. Spread wings in large rimmed baking sheet. 4 of 4 Bake in 450 degree F oven 25 minutes, turning occasionally. Increase heat to broil. 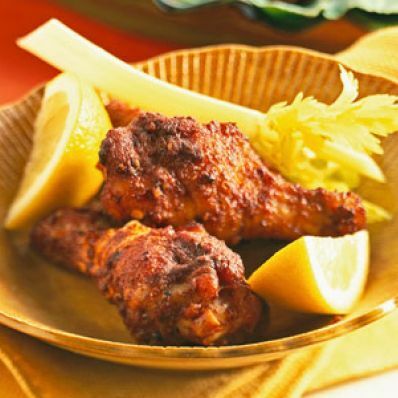 Cook wings under broiler 10 minutes or until skin is crisp. Note: If you have mortar and pestle, substitute seeds for ground, and grind together. Use 1/2 teaspoon coriander seeds, 1/4 teaspoon cumin seeds, 1/4 teaspoon cardamom seeds. Makes 8 servings.